The 16th Lok Sabha elections just concluded with the country supporting BJP’s Prime Ministerial candidate, Shri Narendra Modi, who managed to win the elections with as much popularity and glamor as possible. For the first time in the history of the Indian elections was so much attention paid to conversations on social media, measuring trends on tweets, retweets, likes and followers. 150 million new voters were added this year many of whom are the ones belonging to the connected generation and most parties took steps to reach out to these people online and through social media. 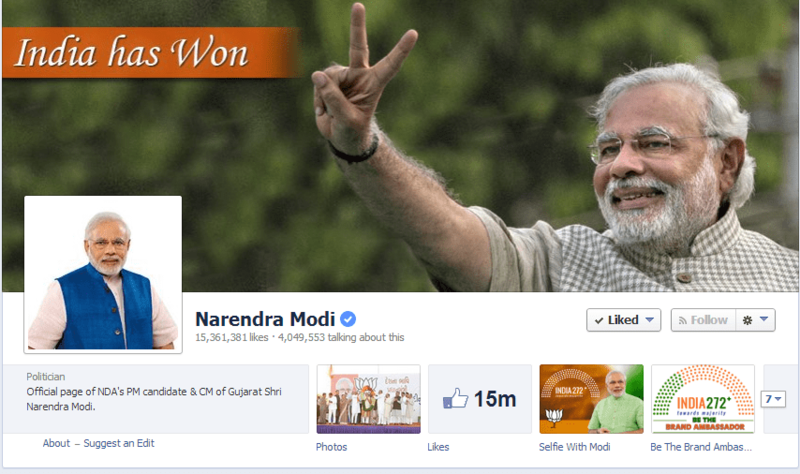 According to Facebook, Narendra Modi’s fan base grew by 14.86 percent between April 7 and May 12, the duration of the elections. Arvind Kejriwal’s count increased by 8.16 percent during the same time. 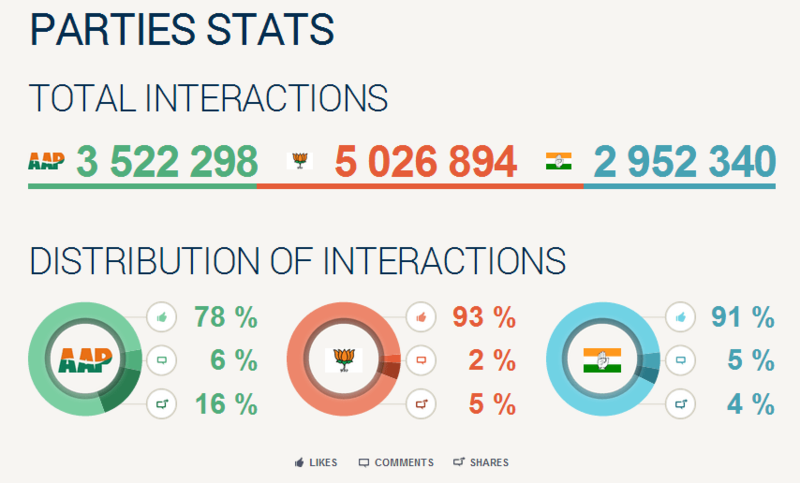 Also, according to Facebook, between the day the elections were announced and May 16, the counting day, 29 million people made 227 million poll-related interactions (posts, comments, shares, and likes), with 13 million people on Facebook posting 75 million updates related to Narendra Modi. Clearly, AAP had great outreach which declined with the course of time because of multiple reasons including a poor messaging strategy. They spoke about corruption and the numerous problems in the country. Sadly they never gave any indication towards the solution for these problems. BJP, on the other hand, offered the hope that people desperately needed. As far as the Congress is concerned, they really did not have any story to tell. Data released by Twitter from January 1 till May 12 shows the graph for the political parties and the rise and fall in the number of tweets. Keeping in sync with real time happenings, the popularity of the BJP soared slowly with the last months leading to the elections showing a huge spike, whilst AAP and Congress were far behind. 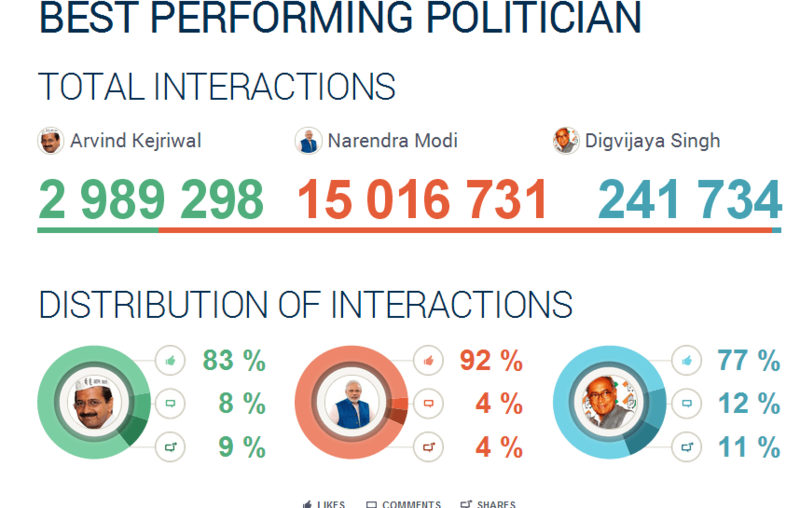 The trends observed for the time period of April 19 to May 18 show how the popularity of the BJP surged, with Modi-related interactions hitting a record of over 15 lakhs, Kejriwal at just over a lakh and Digvijaya Singh of the Congress at just 19,500. On counting day, there were over 2 million tweets. Well, the 2014 elections is just a beginning. The 2019 elections will be the true test of social media strength and how it can make or break any company, political party or even any celebrity, for that matter. The ones who can understand this well will be the ones who’ll definitely come out on top.